The community of Arbor Heights is part of West Seattle, just south of Fauntleroy, west of White Center, and north of Burien. It sits on the Puget Sound and is mainly residential; homes for sale in Arbor Heights are closely-settled single family buildings. Highways 509, 99, and 518 are just a few miles to the east and all lead to I-5, the major north-south route for commuting. Downtown Seattle is less than a 10 mile drive north. 4 Beds | 2.75 Baths | 2160 sq. Ft. Larger building lot with 130 feet of road frontage. May be possible to divide to create two building lots. Price reduced for quick sale. 5 Beds | 2.5 Baths | 2280 sq. Ft.
5 Beds | 2 Baths | 2360 sq. Ft.
2 Beds | 1 Baths | 1140 sq. Ft.
2 Beds | 1 Baths | 1480 sq. Ft.
3 Beds | 1.5 Baths | 3290 sq. Ft.
2 Beds | 1 Baths | 710 sq. Ft.
2 Beds | 1 Baths | 1200 sq. Ft.
3 Beds | 2.25 Baths | 2060 sq. Ft.
4 Beds | 2 Baths | 2280 sq. Ft.
3 Beds | 1.75 Baths | 1480 sq. Ft.
Blue Summit Realty has the most accurate and up to date Arbor Heights real estate listings on the web. 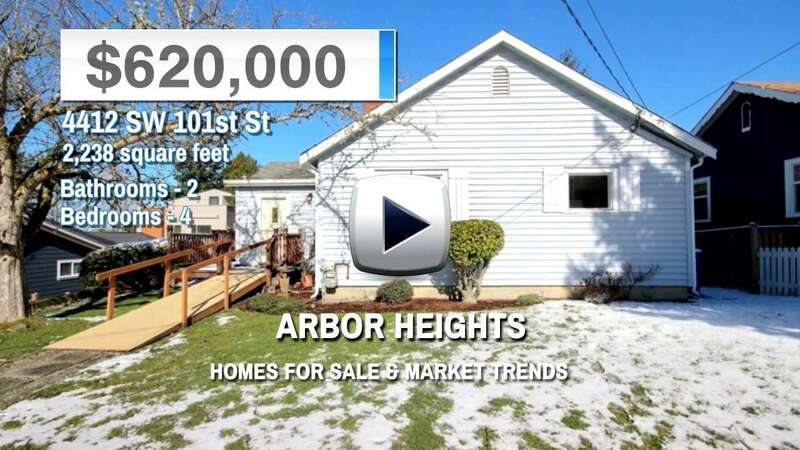 Currently there are 14 homes for sale, and 2 vacant land properties in Arbor Heights. Of the 16 total Arbor Heights residential listings for sale 0 are bank owned, 0 are short sales, 0 are new construction, and 0 are townhomes. The price ranges from $375,000 to $0 with a median list price of $543,880 and median sold price of $531,816. Make sure to refine your Arbor Heights real estate search by property type, price, square footage, bedrooms, bathrooms and more with the search tool above or view the Arbor Heights listings on our interactive map. Our Arbor Heights real estate listings were updated 17 minutes ago.